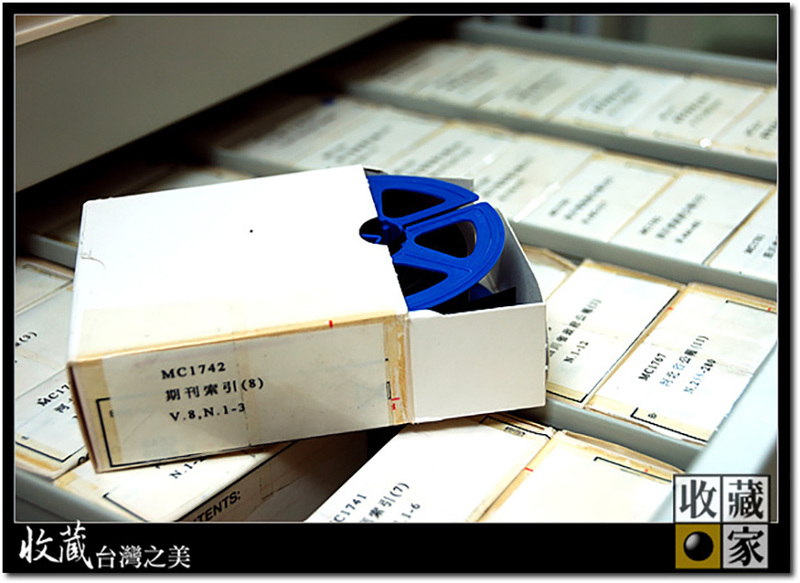 Microfilms are scaled-down reproductions of documents, typically most commonly seen in libraries as a preservation strategy for deteriorating newspaper collections. These type of storage media is essential for archiving records and information that would take up quite a bit of space in it's original physical/paper form. A drawer full of microfilm is able to contain a couple years full of daily newspaper prints. A specialized scanner is required to view the microfilms. This type of archiving method provides a great storage medium while minimizing the amount of physical space required. The Scanner seems small from a distance but it's actually quite a large machine. The concept of micro-photography was introduced in 1839 and was proposed as a document preservation technique in 1851. However, it was not until the era of flexible film that the idea caught on. Originally developed in the 1920s for use in banking, microfilm was embraced by libraries and other institutions: the Library of Congress began a major filming project in 1927. The era of newspaper filming began in 1935 when The New York Times started filming and publishing its print run. In the wake of these two considerable projects, cultural heritage organizations realized they could affordably film their collections not just for preservation, but also for access and distribution, much as digitization is used today. Through the years, microforms have been manufactured on various film bases, including cellulose nitrate, cellulose acetate, and polyester. Cellulose nitrate-based microforms, like other cellulose nitrate films, are highly flammable, prone to releasing hazardous gases over time, and subject to natural decomposition. By the early 1950s, commercial production of all formats of cellulose nitrate film had permanently ceased. Cellulose acetate film, also called safety film, is less flammable than nitrate but will still naturally degrade over time. This degradation process is called vinegar syndrome because of the familiar vinegar smell produced by the acetic acid as it off-gasses. Although a great deal of acetate microfilm exists, acetate film is not acceptable as a preservation medium for microforms. Polyester is the only film base stable enough to be recommended for preservation microfilming. Black-and-white polyester film has a life expectancy of 500+ years under proper storage conditions. Silver-gelatin films are the primary film type of a master film or fiche. Based on the familiar technology of black-and-white photography, this film is the only microform medium appropriate for archival purposes. The original (master) silver-gelatin microfilm is usually a negative image, but positive or negative duplicates can be produced. The emulsion side of this film is matte, while the non-emulsion side is glossy. Silver-gelatin film can be on nitrate, acetate, or polyester bases. Diazo films are used to create a service master, directly copying the master film through contact printing. Diazo films contain diazonium salts in the coating layer that combine with dye couplers to produce strong, dense colors available in a wide range, including black. They may have an acetate or polyester base. Processed black diazo resembles silver gelatin film but is glossy on both sides. Diazo film is reasonably stable, but the dyes will eventually fade, even in darkened storage conditions. Fading is accelerated by prolonged exposure to light (such as in a film reader). Vesicular films use an inexpensive process to create use copies of film and fiche. These films take advantage of the fact that diazonium salts produce nitrogen as they decompose when exposed to UV radiation. In vesicular films, diazonium salt coating is sandwiched between two base layers. The film is placed in direct contact with a master film, exposed, and developed by heating the film. As a result, the image will always exhibit slightly raised areas made of small bubbles. The vesicular film base must be polyester because acetate cannot tolerate the heat used in processing. Mechanical pressure frequently causes damage to vesicular film, as pressure will collapse the bubbles. Another major vulnerability becomes apparent at high temperatures (such as those caused by heat-emitting viewing equipment or ambient air temperature) which cause the base material to soften, allowing the gas contained in the bubbles to expand. As the bubbles grow in size, they can rupture, leaving patches of clear film where the image was formerly visible. This is called bubble migration or movement. Though potential applications for color microforms are numerous, their use as a preservation strategy is limited because the life expectancy of most 35mm color films fall far short of preservation goals. In general, the environmental requirements of microforms resemble those of other photographic materials. Temperature should not exceed 70°F, and cooler temperatures are preferable. Year-round relative humidity lower than 50% is recommended for all film types. An upper limit of 40% is recommended for silver-gelatin films to minimize the likelihood of microscopic blemishes from silver oxidation (sometimes called "measles"). Black and white master films should be stored at 55°F, 50% RH with a recommended maximum of 70°F, 50% RH, ±5%. Particulate pollutants, also known as dust, are a source of scratches and abrasions on microfilm. Silver-gelatin films are particularly vulnerable to such damage. Cleaning of equipment and regular vacuuming is important in storage and use areas. Gaseous air contaminants, such as oxides of sulfur and nitrogen, paint fumes, ammonia, peroxides, ozone, and formaldehyde, can damage film bases and emulsions. These contaminants may produce oxidizing or reducing effects that cause micro-blemishes on silver-gelatin films. Precautions must be taken to reduce the risk of exposure: microforms should not be stored near photocopiers, which can be a source of ozone. In addition, microforms should be removed from any area which is to be painted; fans should be used to provide good air circulation, and paint should be allowed to cure according to factory specifications before films are returned to the space. Wooden shelving or cabinets should not be used in areas where microform masters are stored because harmful acids and other damaging substances are emitted by wood, wood composites, and some sealants and adhesives. Diazo, vesicular, and silver-gelatin films and fiche should not be rolled on the same spools, sleeved in the same enclosures, or stored in the same containers so as to prevent chemical interactions with each other. Space and access problems usually make separate cabinets for different film types impractical, but separate spools and fiche sleeves should always be used. Nitrate and acetate films are a source of acidic deterioration products. They should be physically separated from other films and systematically replaced. " Eureka Dry Tech provided this Microfilm archive with humidity controlled storage with our GD-1000 Filing Series Auto Dry Cabinet. The GD-1000 Auto Dry Box will automatically maintain 50%RH year round without any water tanks to empty or any consumable parts to replace.